Whenever I run into something described as “an original story based on the folklore of (insert people or place),” my fakelore alarm goes off. Loudly. Story: A “good” healer, whose job consists of “swishing and swooshing,” acquires 25 kittens. When he tries to sell them, the “good” healer encounters the ire of the suspicious villagers, stupid as well as poor, who “imagine wild things” and demand that the “good” healer get rid of the cats, whom one calls “filthy rodents.” The “good” healer refuses, so the villagers enlist the aid of an “evil” healer, who sends a pack of coyotes to do away with the cats. The cats outsmart the coyotes, the “evil” healer casts a spell, and the quick-thinking felines save both a villager and the “good” healer, thereby becoming the village heroes. The End. 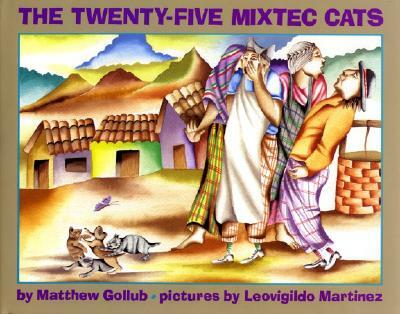 The Twenty-Five Mixtec Cats is a mishmash of cultural components of European fairy tales superimposed on a Mixteca background and marketed as an “original story based on the folklore of Oaxaca.” As such, it doesn’t work on any level. (3) “Healers,” by definition, are good. So the term, “good healer” is unnecessarily repetitive; and the term, “evil healer” is an oxymoron. (4) Finally, and probably most importantly: the references to poverty, superstition, prejudice, good and evil, topped with ignorance, just hang there, decontextualized, as they might in European fairy tales. But European-American children reading versions of European fairy tales will not see themselves reflected in the characters. Mexican-American children reading The Twenty-Five Mixtec Cats, on the other hand, will probably be humiliated. Their personas are not intact; they are felinized. Plus they are easily identifiable by a specific locale. This is like saying that all Viennese are superstitious and ignorant. It is that specific. Oaxacan artist Leovigildo Martinez’s glazed watercolors, on a palette of predominantly yellows, browns, blues and pinks, complement the story. Reviews in School Library Journal, Publishers Weekly, ALA Booklist, and The New York Times were all favorably uncritical. The School Library Journal review noted, for instance, that the faces of the villagers “resemble those of the cats, giving an eerie relatedness to the characters,” and that this story is “a sound introduction to some of the elements of Mexican folklore.” That’s exactly the problem. Pues, a mi, no me gusta su idea. It’s cultural tourism for a piece of the “multicultural” children’s book market, plain and simple. The Twenty-Five Mixtec Cats is totally not recommended. As the author of this book, I read your review carefully. I have to say many of your charges are simply off base. Pull up a chair, this is probably the website's most in depth response. Let’s start by correcting, and updating, the bibliographic data. The illustrator’s name is Leovigildo Martinez, not Geovigildo. As of 2004, the book’s publisher is Tortuga Press, not Tambourine Books. Subject words more applicable to collections include: Cats, Healers, Magic, Mexico, and Oaxaca. Now let’s look at some of your statements. In (1) you say that "Oaxaca is the Indian part of Mexico." Wow. That's misleading. Oaxaca is the name of a southern state in Mexico. It is also the name of the sprawling capital city of that state. The capital has a colonial history which dates back 500 years. What’s more, indigenous peoples are dispersed among many Mexican states with Oaxaca, Veracruz, Chiapas, Puebla, Yucatán, Hidalgo and the state of Mexico topping the list. In (2) you say that “Mixteca refers to the ethnicity and culture of a people who live in Oaxaca, Puebla, and part of Guerrero. It also refers to the language." In (4), you write "the references to poverty, superstition, prejudice, good and evil, topped with ignorance, just hang there, decontextualized, as they might in European fairy tales.… Mexican-American children reading The Twenty-Five Mixtec Cats… will probably be humiliated." Nope, wrong again. I never placed the story in a specific locale by naming a village or town where it is set. And it’s really nothing like saying “all Viennese are superstitious and ignorant.” Remember, the story’s most important character is intelligent and kind. In the end, the previously prejudicial neighbors accept and appreciate the newcomer cats. The ability to adjust one’s thinking after processing new information is also a sign of intelligence. Thank you for catching the typo in Sr. Martinez’s name. I have corrected the spelling. The publisher of the book I reviewed is Tambourine Books and I have corrected the publisher line to read: “Tambourine Books/ William Morrow.” We do not label subject words that may be “applicable to collections”; rather, we label terms specific to each review, i.e., name of author, name of illustrator, name of publisher, name of reviewer, relevant nation or ethnicity, and any other relevant information. You list a lot of details to quibble about while sidestepping the main issues, and since the details are correct the way I wrote them, I’m going to get to the important part. You mention in your note that “both the English and Spanish editions of this book have been collected and embraced by librarians and teachers across the U.S. and Mexico (including by educators in Oaxaca).” Yes, I’ve read several reviews and, as I noted, they are all favorably uncritical. That’s problematic, because the “mainstream” reviewers generally rely on the cultural components of European fairytales in evaluating the contents of a story that is purported to contain at least some cultural components of an oral story from a non-European people. In her amazing essay, “Not Just Entertainment,” Lenore Keeshig-Tobias writes: “The issue is culture theft, the theft of voice. It’s about power.” I’ll leave it at that. And thank you for calling my attention to your other children’s books, THE MOON WAS AT A FIESTA/ LA LUNA SE FUE DE FIESTA, and UNCLE SNAKE/ TIO CULEBRA. We’ll make sure to read them. Note: I encourage you (and other readers of DE COLORES) to read Lenore Keeshig-Tobias’s essay, “Not Just Entertainment,” in THROUGH INDIAN EYES: THE NATIVE EXPERIENCE IN BOOKS FOR CHILDREN (Oyate, 2006), and Eliot A. Singer’s research paper, “Fakelore, Multiculturalism, and the Ethics of Children’s Literature” (https://www.msu.edu/user/singere/fakelore.html). You wrote: (3) “Healers,” by definition, are good. So the term, “good healer” is unnecessarily repetitive; and the term, “evil healer” is an oxymoron. All right, now it’s getting interesting. Beverly, you speak Spanish, right? Put yourself in my shoes for a moment. In writing this story I interviewed many people in Spanish in and around La mixteca. When people related to me local stories of magic and mystery, one term that came up time and again was “curandera mala”. How to translate such a phrase into English? To me, calling such an actor a “witch” sounded too European. Ditto with “sorcerer” (hechicero/a in Spanish). But translating the phrase to “evil healer” hinted at the complexity of a "curandera mala," who, depending on the circumstance, might use her knowledge for good or ill. Sometimes when writing about foreign cultures you just have to go with the words local people use even if the translation doesn’t fit neatly into our own cultural framework. The illustrator incidentally, Leovigildo Martinez, is a Oaxacan of Mixtec and Zapotec ancestry. I can see him and everyone else I interviewed shaking their heads upon hearing that a well-meaning reviewer in "el norte" has determined their phrase to be oxymoronic. I’m not going to debate you on good medicine and bad medicine, and the people who practice each in various parts of Mexico and the world. That is far afield of the topic at hand, and frankly, it’s not worth the trouble. There’s just this: Generally, healers or curanderos/as are doctors who have had many years of training in herbal medicine and ceremony. They deal with physical ailments, and also social, psychological, and spiritual problems. Sometimes, curanderismo complements modern medicine. But your “good healer” just sweeps illnesses away by “swishing and swooshing” herbs. On the other hand, brujos/as or hechiceros/as are witches or sorcerers. Some may be “curanderos/as malos/as,” trained doctors who started out good, and who, somehow, have abused their training and powers and bring death and destruction instead of healing. But your term, “evil healer,” doesn’t work, either. (That’s why I wrote that it’s an oxymoron.) What you have is just a simplistic “good vs. evil,” a European colonial binary that does not have anything to do with Indigenous Mexican cultures or folklores. TWENTY-FIVE MIXTEC CATS is a dishonest pretense. That’s it.